Although the Wrights eventually sold the Flyer to the Army in 1909, the negotiations began years before. The Wrights first contacted the U.S. government as a customer in 1905. Because they were reluctant to share any details of their airplane, and because the government had had bad experiences with earlier would-be aircraft inventors, initial discussions went nowhere. The flight trials at Fort Myer, Virginia. By late 1907, with negotiations in Europe going well, the U.S. Army showed renewed interest in the Wright brothers. Rather than directly offering them a contract, the Board of Ordnance and Fortification and the U.S. Signal Corps announced an advertisement for bids to construct an airplane. However, the design and performance specifications were such that the Wrights were the only viable bidder. A price of $25,000 was set for the brothers’ airplane if they could meet the performance criteria in actual flight trials. The flight trials were scheduled for late summer 1908 at Fort Myer, Virginia, a military post just outside Washington, D.C. With the commitments in Europe, the brothers had to separate for the first time. With Wilbur off to France, Orville did the flying for the Army. On September 17, 1908, with Army observer Lt. Thomas E. Selfridge on board, the airplane experienced a mechanical malfunction involving one of the propellers and crashed. Orville was severely injured and Selfridge died, the first fatality in a powered airplane. Orville would resume the flight trials after his recovery. The Wrights returned to Fort Myer to complete the Army trials after the homecoming celebrations in June 1909. Over several weeks, the Wrights fulfilled each requirement in Signal Corps Specification No. 486. The final one was a cross-country flight of 10 miles with a passenger. This flight also served as the official speed trial. The contract stipulated that they would receive a 10 percent bonus for every full mile per hour above 40. Their average speed was 42.5 miles per hour, which rewarded them with a $5,000 bonus and brought the final purchase price of the airplane to $30,000. 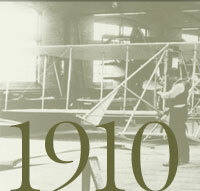 The Wrights returned to Fort Myer in 1909 with an entirely new airplane. The Army purchased it that year, used it to train pilots in the fall of 1909 and in 1910, then donated it to the Smithsonian Institution in 1911 after acquiring other aircraft. Designated Signal Corps No. 1 by the Army, it is generally referred to as the Wright Military Flyer and was the world’s first military airplane. Also interested in aviation, the U.S. Navy purchased a Wright Model B airplane in 1911 and modified it for water takeoff. However, the Navy preferred the aircraft produced by Glenn Curtiss, who had designed airplanes specifically for operating off water. American flag flown on the Fort Myer airplane in 1908. Passes to the Fort Myer flight trials.